“In 2010, my knee was pulled and smashed against a rock by someone at a hiking trip. After that, I can’t walk up and down the stairs without feeling the pain on my knee. At that time, I thought I can never do any outdoor activities and I never dream of running a marathon. After seeing Dr. Binh Nguyen, he used BioFreeze and Graston Technique on my knee and showed me the proper way to put KT Tape on my knee . Because of Dr. Nguyen, I can run and completed the 2013 NYC Marathon. It is NYC lost that he relocated to Boston, but it’s Boston gain to have him there to help other people like me. 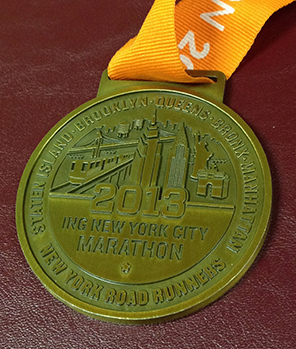 Having a 2013 NYC Marathon Finisher Medal is a reminder that he is a great Chiropractor.” - Becky L .
"I envy all of Dr. Binh's new and future patients. I'm one of his former patients from NYC and I miss my appointments with him. I must say, I much prefer a session with him rather than a massage. I always left his office feeling amazing and refreshed, almost as if I had a new back. He was very flexible and understanding of my very busy work schedule and always managed to work with me and get me in for my appointments. That made my life a bit easier and I thank him for that. I would recommend him to my New England family if they are ever in need of a chiropractor. I know that I wouldn't mind paying him a visit when I am up there seeing family." - Carmen Ivy T.
"Dr. Binh is an exceptional Chiropractor! I had been suffering with severe TMJ pain and within 5 sessions my pain and range of motion is almost at baseline. I cannot recommend Cedar Chiropractic & Sports enough. I highly recommend seeking out Dr. Binh before considering surgery or medications to treat TMJ symptoms. He accepts medical insurance, I pay my typical co-payment. No words can truly express the relief I am experiencing from being almost pain free from TMJ symptoms after several months of extreme pain." - Christine B. "Dr. Binh is the best at what he does, he's both excellent in his profession and as a person. He's helped me to achieve my dream career job, because he cares about helping people and getting the treatment that is right for you to be in 110% great shape. When I was in training for my career there was a requirement to complete a run, being out of shape for years I developed severe shinsplints. Every run that I was in I had no choice to drop out due to the pain.If I could not complete the run I would fail and get fired. I went through countless and useless medical doctors just telling me to ice my knees, take painmeds and I ll be fine.I found.dr. binh through a google search because he specializes in cold laser therapy, he treated me almost everyday and diagnosed that I had 13 muscle knotts in my knees. Basically he took care of it, and I healed up and passed the academy/run and started my career dream job all thanks.to dr.binh, also dr.binh wanted me to heal up 110% after I passed he mentioned that my insurance did not cover all my treatments but he treated me anyway because he wanted to see me pass, get my career job, and because he cares and loves to help people. Please see dr.binh you will not disappointed he is the best!!!" - Christopher G.
“Dr. Binh is wonderful! He's attentive, caring, never rushed, completely thorough with his treatment, and his level of expertise is very reassuring. I know I'm in great hands.” - Martha K.
"I began going to Cedar Chiropractic and Sports in Hopkinton to get treatment by Dr. Binh Nguyen for a strained calf muscle. After just a few weeks of treatment, I've returned to training for a summer triathlon. I've found Dr. Nguyen to be highly skilled as a sports chiropractor who really cares about his patients. He uses the Graston Technique and Active Release, a combination that works especially well for me." -Joann B. "I've been to see Binh twice now in his small office in Hopkinton. Each time, I have left feeling so much better than when I hobbled in. I tend to have muscle problems and knots in my back and, boy, does he get them out. He's got the strongest hands - ever! It's amazing how much better I feel! When I told him, on my last visit, that I've been washing dishes at the school cafeteria, he explained what I needed to do to keep my muscles healthy and not cramping up. He's also been able to get me right in so I don't have to wait long for an appointment. Thank you, Dr. Binh!!" - Teresa B. "I have to thank Dr.Binh's significant other besides thanking Dr.Binh too! She convinced me to get my knee checked out. Otherwise I still would still be in pain. Before seeing Dr.Binh, I couldn't get up from a chair or walk down stairs without knee pain. I was apprehensive but Dr.Binh took the time to explain all the treatment and what exercise I should perform to build up my knee. After several consistent cold laser therapy and graston technique sessions, I was able to hike, paddle and ski! I can't thank Dr. Binh enough for helping me to live without pain. Thank you!" - Carol N.
"Dr. Binh is an amazing chiropractor with a huge emphasis on sports, sports performance, sports injury, and sports recovery. He has been with the dragon boat community providing his expertise and care in New York City and speaking as a fellow colleague who had been treated by him, we were sorry to see him go but happy to see him extend his craft to the folks of Hopkinton. Dr. Binh is very knowledgeable and caring, providing only the best in care." - Dr. Chris C.
"I came in with lower back pain and it prevented me from working. After just 2 visit I was completely pain free thanks to Dr. Nguyen." -Roberta E.
"Dr. Nguyen was a very caring and compassionate doctor. Not only was he an excellent healer but he was able to work with me for a cash payment plan even thou I didn't have insurance. I recommend Dr. Nguyen because he cares." -Jose M.
"Thanks to Dr. Nguyen, I can now move, reach twist, bend and enjoy my golf game virtually pain free after not even a year of treatment. Everything Dr. Nguyen says about chiropractic not only make a world of sense but also offer alot of hope of relief from my pain instead of just learning how to put up with it. And because of his optimism and strong encouragement, I started applying better health decisions in other area of my life. And because of this I opt out on surgery and can live a pain free life with chiropractic care." -David T.
"He's got the magic hand and I recommend him" -Oscar P.
"I had doubts in chiropractic and he made me a believe that I can live pain free without pain medicine." -Michelle F.
"I see him once a week and because of this I can move better and got in tune with my body and now I'm trying out Yoga. Thanks a million Dr. Binh" -Anna K.
"All my life I've been going to a chiropractor for treatment and Dr. Nguyen is an awesome doctor since he listens to you and treat the cause of the problem. He correct my problem with only 1 visit and I come to him every now and then for wellness care or when I have problem or any pain." -Pierre V.
"After an injury from a motor vehicle accident my back wasn't the same any more. I was not able to do the same especially with work. But Dr. Binh was able to help me recover and I follow his chiropractic therapy plan to a tee. Now I'm able to do the many things and put my injury aside. I'm a strong believer of chiropractic now. It's just not about getting the kinks out off your back and neck it's about injury prevention before it occurs. " - Anthony T.
"I was told by my orthopadeic surgeon that I need surgery for my right shoulder. But after consulting with Dr. Nguyen he was able to help me avoid surgery and got me well again without surgery. Now I can play Tennis without pain. Thanks so much doc" - Cindy L.
"I came in with constant back pain thinking there was no help. Dr. Binh help me by addressing my posture, work ergonomics and assess how I slept. He prescribe me the Tempur-Pedic pillow and the Core Health Bed. Now I come back to see the doctor once a month for regular spinal care." - Janet P.